We have not made any plans for afternoon activities. With 8 cars, we don’t all need to do the same. The possibilities we have thought of are shown below. For more information on these, click on the links. If you know of any other interesting possibilities, please tell me so that I can add them to this page. 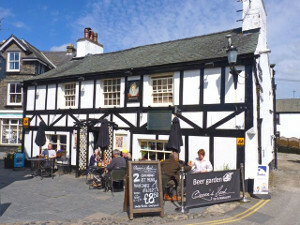 Keswick Town is worth a visit if you want to buy walking equipment. The Derwentwater Marina on the edge of Keswick is attractive, and you can hire a boat or have a ride around the lake on the Derwentwater Launch. Watendlath is a very attractive hamlet above Borrowdale. On the way up you pass the much-photographed Ashness Bridge. The Honister Slate Mine at the top of the Honister Pass is interesting. Grasmere is one of the most attractive villages in the Lake District. It has the advantage of being close to Rydal Hall, but it can be over-crowded. Dove Cottage was Wordsworth’s home, and has a Wordsworth Museum. It is close to Rydal Hall. The Ruskin Museum in Coniston covers the history of Coniston, and has a display devoted to Donald Campbell. Brantwood was John Ruskin’s home, and is wonderfully situated on the east bank of Coniston Water. You can have an interesting cruise on the steam yacht Gondola which sails on Coniston Water. Hawkshead is another attractive village. Like Grasmere, it can be over-crowded. Hill Top near Hawkshead was Beatrix Potter’s Home. If you feel adventurous, you could try hiring a boat on Windermere. © Copyright Mike Smith and licensed for reuse under this Creative Commons Licence.